"Bismarck" redirects here. For other uses, see Bismarck (disambiguation). Otto Eduard Leopold, Prince von Bismarck, Duke of Lauenburg (April 1, 1815 – July 30, 1898) European statesmen of the 19th century. As Minister-President of Prussia from 1862 to 1890, he engineered the unification of the numerous states of Germany. From 1867 on, he was Chancellor of the North German Confederation. When the German Empire was declared in 1871, he served as its first Chancellor. 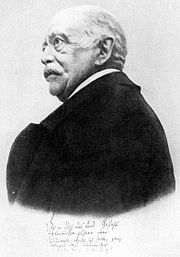 Bismarck held conservative monarchical views in the tradition of Clemens von Metternich, the Austrian statesman who devised the diplomatic arrangements which governed Europe after the Napoleonic Wars–arrangements which Bismarck upset. Bismarck's primary objectives were to ensure the supremacy of the Prussian state within Central Europe, and of the aristocracy within the state itself. His most significant achievement was the creation of the modern German state, with Prussia at its core, through a series of wars and political manoeuvrings in the 1860s. The final act, the Franco-Prussian War of 1870-1871, saw Prussia break France's power on the European continent. Bismarck was less successful in creating a unified German nation. His attempts to eliminate the political and cultural strength of the Roman Catholic Church within Germany–the so-called Kulturkampf–was only partially successful. His similar struggle against Social Democrats (Sozialistengesetze) was unsuccessful, although under his governance Germany enacted what was at the time progressive social legislation. From 1862 to 1888 Bismarck served at the pleasure of King (later Emperor) Wilhelm I, with whom he shared a similar outlook and enjoyed a cordial relationship. The accession of Wilhelm's grandson, Wilhelm II, who was more than 40 years younger than Bismarck, marked the decline of Bismarck's influence, and he was eventually forced to resign and retire into private life in 1890. Already a member of the landed aristocracy, Bismarck was further ennobled several times through his career. He was made a count (Graf) in 1865 and prince (Fürst) in 1871. On his departure from office in 1890 he was also made the non-hereditary Duke of Lauenburg. As Swiss historian Siegfried Weichlein concludes, rather than the heroic, triumphant style typical of older interpretations, the tone of recent scholarly studies of Bismarck is more subdued. They reveal a pessimistic politician whose political style could be characterized as defensive-aggressive. Bismarck had serious doubts about the future and stability of the recently-founded German empire. Bismarck does not come through as a charismatic politician who required permanent crises in order to display his political finesse. He did not need and produce crisis to stabilize his power. Instead, he saw himself as part of a permanent political crisis, a crisis he responded to not with charisma, but with repression. Bismarck was born in Schönhausen, the family estate in the old Prussian province of Brandenburg (now Saxony-Anhalt), situated west of Berlin. His father, Ferdinand von Bismarck, was a landowner and a former Prussian military officer; his mother, Wilhelmine Mencken, was from a Lower Saxon burgher family. Otto von Bismarck had several siblings, but only an elder brother, Bernhard and a younger sister, Malvina survived into adulthood. Bismarck was educated at the Friedrich-Wilhelm-Gymnasium and the Graues Kloster-Gymnasium. Then at age 17, he joined the Georg August University of Göttingen, where he spent only a year as a member of the Corps Hannovera before enrolling in the Friedrich Wilhelm University of Berlin. His years at university were marked by what Otto Pflanze called "exaggerated masculinity," including the fighting of 50 duels and excessive drinking. Although Bismarck hoped to become a diplomat, he could only obtain minor administrative positions in Aachen and Potsdam. On his mother's death in 1839 Bismarck took over the management of the family estates in Pomerania. About eight years later, he returned to Schönhausen, where he became engaged in local politics. He married the noblewoman Johanna von Puttkamer in 1847. Like Puttkamer, he became a Pietist Lutheran. Their long and happy marriage produced one daughter (Marie) and two sons (Herbert and Wilhelm, known as "Bill"), all of whom survived into adulthood. In the year of his marriage, Bismarck was chosen as a representative to the newly created Prussian legislature, the Vereinigter Landtag. There, he gained a reputation as a royalist and reactionary politician; he openly advocated the idea that the monarch had a divine right to rule. In March the next year (1848), Prussia faced a revolution (one of the Revolutions of 1848 in various European nations), which completely overwhelmed King Friedrich Wilhelm IV. The monarch, though initially inclined to use armed forces to suppress the rebellion, ultimately succumbed to the revolutionary movement. He offered numerous concessions to the liberals: he promised to promulgate a constitution, agreed that Prussia and other German states should merge into a single nation, and appointed a liberal, Ludolf Camphausen, as Minister-President. But the liberal victory perished by the end of the year. The movement became weak due to internal fighting, whilst the conservatives regrouped, gained the support of the King, and retook control of Berlin. Although a constitution was granted, its provisions fell far short of the demands of the revolutionaries. In 1849, Bismarck was elected to the Landtag, the lower house of the new Prussian legislature. At this stage in his career, he opposed the unification of Germany, arguing that Prussia would lose its independence in the process. He accepted his appointment as one of Prussia's representatives at the Erfurt Parliament, an assembly of German states that met to discuss plans for union, but only in order to oppose that body's proposals more effectively. The Parliament failed to bring about unification, for it lacked the support of the two most important German states, Prussia and Austria. In 1851, Friedrich Wilhelm appointed Bismarck as Prussia's envoy to the diet (assembly) of the German Confederation in Frankfurt. His eight years in Frankfurt were marked by changes in his political opinions. No longer under the influence of his ultraconservative Prussian friends, Bismarck became less reactionary and more moderate. He became convinced that Prussia would have to ally itself with other German states in order to countervail Austria's growing influence. Thus, he grew more accepting of the notion of a united German nation. In 1858, Friedrich Wilhelm IV suffered a stroke that paralysed and mentally disabled him. His brother, Wilhelm, took over the government of Prussia as Regent. Soon he replaced Bismarck as envoy in Frankfurt and made him Prussia's ambassador to Russia. This was a promotion in his career as Russia was one of the two most powerful neighbors of Prussia (the other was Austria). The Regent also appointed Helmuth von Moltke as the new Chief of Staff for the army, and Albrecht von Roon as Prussian Minister of War and to the job of reorganizing the army. These three men over the next 12 years transformed Prussia. Bismarck stayed in St. Petersburg for four years, during which he befriended his future adversary, the Russian Prince Gorchakov. In June 1862, he was sent to Paris, so that he could serve as ambassador to France. Despite his lengthy stay abroad, Bismarck was not entirely detached from German domestic affairs; he remained well-informed due to his friendship with Roon, and they formed a lasting political alliance. The Regent became King Wilhelm I upon his brother's death in 1861. The new monarch was often in conflict with the increasingly liberal Prussian Diet. A crisis arose in 1862, when the Diet refused to authorise funding for a proposed re-organisation of the army. The King's ministers could not convince legislators to pass the budget, and the King was unwilling to make concessions. Wilhelm believed that Bismarck was the only politician capable of handling the crisis, but was ambivalent about appointing a man who demanded unfettered control over foreign affairs. When, in September 1862, the Abgeordnetenhaus (House of Deputies) overwhelmingly rejected the proposed budget, Wilhelm was persuaded to recall Bismarck to Prussia on the advice of Roon. On 23 September 1862, Wilhelm appointed Bismarck Minister-President and Foreign Minister. Bismarck was intent on maintaining royal supremacy by ending the budget deadlock in the King's favour, even if he had to use extralegal means to do so. He contended that, since the Constitution did not provide for cases in which legislators failed to approve a budget, he could merely apply the previous year's budget. Thus, on the basis of the budget of 1861, tax collection continued for four years. Bismarck's conflict with the legislators grew more heated during the following years. In 1863, the House of Deputies passed a resolution declaring that it could no longer come to terms with Bismarck; in response, the King dissolved the Diet, accusing it of trying to obtain unconstitutional control over the ministry. Bismarck then issued an edict restricting the freedom of the press; this policy even gained the public opposition of the Crown Prince, Friedrich Wilhelm (the future King Friedrich III). Despite attempts to silence critics, Bismarck remained a largely unpopular politician. His supporters fared poorly in the elections of October 1863, in which a liberal coalition (whose primary member was the Progressive Party, or Fortschrittspartei) won over two-thirds of the seats in the House. The House made repeated calls to the King to dismiss Bismarck, but the King supported him as he feared that if he dismissed him, a liberal ministry would follow. Before unification, Germany consisted of a multitude of principalities loosely bound together as members of the German Confederation. Bismarck played a crucial role in uniting most of them into a single state. In his first speech as Minister-President, he had referred to the issue of German unification in a now famous remark: "the great questions of the day will not be decided by speeches and the resolutions of majorities — that was the great mistake from 1848 to 1849 — but by iron and blood." This was later changed to the now famous "blood and iron". He was referring to the failed Frankfurt Parliament as the great mistakes of 1848 and 1849. Bismarck used both diplomacy and the Prussian military to achieve unification. He excluded Austria from unified Germany, for he sought to make Prussia the most powerful and dominant component of the nation. Bismarck faced a diplomatic crisis when Frederick VII of Denmark died in November 1863. Succession to the duchies of Schleswig and Holstein was disputed; they were claimed by Christian IX (Frederick VII's heir as King) and by Frederick von Augustenburg (a German duke). Prussian public opinion strongly favoured Augustenburg's claim. Bismarck took an unpopular step by insisting that the territories legally belonged to the Danish monarch under the London Protocols signed a decade earlier. Nonetheless, Bismarck did denounce Christian's decision to annex the duchy of Schleswig to Denmark proper. With support from Austria, he issued an ultimatum for Christian IX to return Schleswig to its former status; when Denmark refused, Austria and Prussia invaded, commencing the Second war of Schleswig and Denmark was forced to cede both duchies. Originally, it was proposed that the Diet of the German Confederation (in which all the states of Germany were represented) should determine the fate of the duchies; but before this scheme could be effected, Bismarck induced Austria to agree to the Gastein Convention. Under this agreement signed August 20, 1865, Prussia received Schleswig, while Austria received Holstein. But in 1866, Austria reneged on the prior agreement by demanding that the Diet determine the Schleswig-Holstein issue. Bismarck used this as an excuse by charging that the Austrians had violated the Convention of Gastein, and sent Prussian troops to occupy Holstein. Provoked, Austria called for the aid of other German states, who quickly became involved in the Austro-Prussian War. With the aid of Albrecht von Roon's army reorganization, the Prussian army was nearly equal in numbers to the Austrian army. With the organizational genius of Helmuth von Moltke the Elder, the Prussian army fought battles it was able to win. To the surprise of the rest of Europe, Prussia quickly defeated Austria and its allies, in a crushing victory at the Battle of Königgrätz (aka "Battle of Sadowa"). As a result of the Peace of Prague (1866), the German Confederation was dissolved; Prussia annexed Schleswig, Holstein, Frankfurt, Hanover, Hesse-Kassel, and Nassau; and Austria promised not to intervene in German affairs. To solidify Prussian hegemony, Prussia and several other North German states joined the North German Confederation in 1867; King Wilhelm I served as its President, and Bismarck as its Chancellor. Military success brought Bismarck tremendous political support in Prussia. In the elections to the House of Deputies in 1866, liberals suffered a major defeat, losing their large majority. The new, largely conservative House was on much better terms with Bismarck than previous bodies; at the Minister-President's request, it retroactively approved the budgets of the past four years, which had been implemented without parliamentary consent. Hence, Bismarck is considered one of the most talented statesmen in history. Prussia's victory over Austria increased tensions with France. The French Emperor, Napoleon III, feared that a powerful Prussia would upset the balance of power in Europe. Bismarck, at the same time, sought war with France; he believed that if the German states perceived France as the aggressor, they would unite behind the King of Prussia. A suitable premise for war arose in 1870, when the German Prince Leopold of Hohenzollern-Sigmaringen was offered the Spanish throne, which had been vacant since a revolution in 1868. France blocked the candidacy and demanded assurances that no member of the House of Hohenzollern become King of Spain. To provoke France into declaring war with Prussia, Bismarck on July 14 (Bastille Day) published in Paris the Ems Dispatch, a carefully edited version of a conversation between King Wilhelm and the French ambassador to Prussia. Wilhelm I was proclaimed German Emperor in the Hall of Mirrors in Versailles, France. France mobilized and declared war on July 19 (five days later). It was seen as the aggressor and German states, swept up by nationalism and patriotic zeal, rallied to Prussia's side and provided troops. The Bismarck family contributed its two sons to the Prussian cavalry. The Franco-Prussian War (1870) was a great success for Prussia. The German army, commanded by Helmuth von Moltke the Elder, won victory after victory. The major battles were all fought in one month (August 7 till September 1), the French were defeated in every battle. The remainder of the war featured very careful German operations and massive confusion on the part of the French. At the end, France was forced to pay a large indemnity and surrender Alsace and part of Lorraine. Bismarck opposed the annexation, arguing it would be the "Achilles' Heel" of the new empire, but Moltke and his generals insisted that it was needed to keep France defensive. In his later years Bismarck liked to say that Prussia’s wars against Austria and France had come about through his careful design. Many historians have taken his statements at face value, and it has become received wisdom that this was the case. But study of the facts, particularly of the Franco-Prussian war), shows that this, like many of Bismarck’s later assertions, was far from the truth. Otto von Bismarck became Chancellor of Germany in 1871. 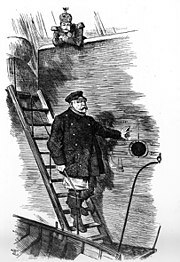 In 1871, Otto von Bismarck, who was a Graf (Count), was raised to the rank of Fürst (Prince). He was also appointed Imperial Chancellor of the German Empire, but retained his Prussian offices (including those of Minister-President and Foreign Minister). Thus he held almost complete control of domestic and foreign policy. The office of Minister-President (M-P) of Prussia was temporarily separated from that of Chancellor in 1873, when Albrecht von Roon was appointed to the former office. But by the end of the year, Roon resigned due to ill health, and Bismarck again became M-P. In the following years, one of Bismarck's primary political objectives was to reduce the influence of the Catholic church in Germany. This may have been due to the anti-liberal message of Pope Pius IX in the Syllabus of Errors of 1864, and the dogma of Papal infallibility (1870). Prussia (except Rhineland) and most other northern German states were predominantly Protestant, but many Catholics lived in the southern German states (especially Bavaria). In total, one third of the population was Catholic. Bismarck believed that the Roman Catholic Church held too much political power, and was also concerned about the emergence of the Catholic Centre Party (organised in 1870). Accordingly, he began an anti-Catholic campaign known as the Kulturkampf. In 1871, the Catholic Department of the Prussian Ministry of Culture was abolished. In 1872, the Jesuits were expelled from Germany. Bismarck somewhat supported the emerging anti-Roman Old Catholic Churches and Lutheranism. More severe anti-Roman Catholic laws of 1873 allowed the government to supervise the education of the Roman Catholic clergy, and curtailed the disciplinary powers of the Church. In 1875, civil ceremonies were required for weddings, which could hitherto be performed in churches. But these efforts only strengthened the Catholic Centre Party. In 1878 Bismarck abandoned the Kulturkampf. Pius died that same year, replaced by a more pragmatic Pope Leo XIII. The Kulturkampf had won Bismarck a new supporter in the secular National Liberal Party, which had become Bismarck's chief allies in the Reichstag. But in 1873, Germany and much of of Europe had endured the Long Depression since the crash of the Vienna Stock Exchange in 1873, the Gründerkrise. A downturn hit the German economy for the first time since vast industrial development in the 1850s after the 1848–49 revolutions. To aid faltering industries, the Chancellor abandoned free trade and established protectionist tariffs, which alienated the National Liberals who supported free trade. This marked a rapid decline in the support of the National Liberals, and by 1879 their close ties with Bismarck had all but ended. Bismarck instead returned to conservative factions — including the Centre Party — for support. To prevent the Austro-Hungarian problems of different nationalities within one state, the government tried to Germanize the state's national minorities, situated mainly in the borders of the empire, such as the Danes in the North of Germany, the French of Alsace-Lorraine and the Poles in the East of Germany. His policies concerning the Poles of Prussia were generally unfavourable to them, and sometimes were viewed as anti-Polish, furthering enmity between the German and Polish peoples. The policies were usually motivated by tactical considerations of what was best for Germany; Bismarck had no personal dislike for Poles, and spoke Polish. Bismarck worried about the growth of the socialist movement — in particular, that of the Social Democratic Party. In 1878, he instituted a variety of anti-socialist laws. Socialist organizations and meetings were forbidden, as was the circulation of socialist literature. Socialist leaders were arrested and tried by police courts. But despite these efforts, the movement steadily gained supporters and seats in the Reichstag. Socialists won seats in the Reichstag by running as independent candidates, unaffiliated with any party, which was allowed by the German Constitution. Then the Chancellor tried to reduce the appeal of socialism to the public, by trying to appease the working class. He enacted a variety of paternalistic social reforms, which can be considered the first European labor laws. The Health Insurance Act of 1883 entitled workers to health insurance; the worker paid two-thirds, and the employer one-third, of the premiums. Accident insurance was provided in 1884, whilst old age pensions and disability insurance in 1889. Other laws restricted the employment of women and children. Still, these efforts were not very successful; the working class largely remained unreconciled with Bismarck's conservative government. In foreign affairs, Bismarck devoted himself to keeping peace in Europe, so that the strength of the German Empire would not be threatened. He was forced to contend with French revanchism — the desire to avenge the loss in the Franco-Prussian War. Bismarck adopted a policy of diplomatically isolating France, while maintaining cordial relations with other nations in Europe. In order to avoid alienating the United Kingdom, he declined to seek a colonial empire or an expansion of the navy. In 1872, he offered friendship to the Austro-Hungarian Empire and Russia, whose rulers joined Wilhelm I in the League of the Three Emperors also known as the Dreikaiserbund. Bismarck also maintained good relations with Italy. But after Russia's victory over the Ottoman Empire in the Russo-Turkish War, 1877-78, Bismarck helped negotiate a settlement at the Congress of Berlin. The Treaty of Berlin, 1878, revised the earlier Treaty of San Stefano, reducing the great advantages it gave to Russia in southeastern Europe. Bismarck and other European leaders opposed the growth of Russian influence, and so tried to protect the power of the Ottoman Empire (see Eastern Question). As a result, Russo-German relations suffered; the Russian Prince Gorchakov denounced Bismarck for compromising his nation's victory. The relationship further suffered due to Germany's protectionist policies. 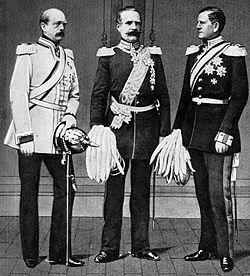 The League of the Three Emperors having fallen apart, Bismarck negotiated the Dual Alliance of 1879 with Austria-Hungary. This became the Triple Alliance in 1882 with the addition of Italy. Attempts to reconcile Germany and Russia did not have lasting effect: the Three Emperors' League was re-established in 1881, but quickly fell apart, and the Reinsurance Treaty of 1887 was allowed to expire in 1890. At first, Bismarck opposed the idea of seeking colonies, arguing that the burden of obtaining and defending them would outweigh the potential benefits. But during the late 1870s public opinion shifted to favour the idea of a colonial empire. Other European nations also began to rapidly acquire colonies (see New Imperialism). During the early 1880s, Germany joined other European powers in the Scramble for Africa. Among Germany's colonies were Togoland (now part of Ghana and Togo), Cameroon, German East Africa (now Rwanda, Burundi, and Tanzania), and German South-West Africa (now Namibia). The Berlin Conference (1884–1885) established regulations for the acquisition of African colonies; in particular, it protected free trade in certain parts of the Congo basin. "Bulgaria, that little country between the Danube and the Balkans, is far from being an object of adequate importance… for which to plunge Europe from Moscow to the Pyrenees, and from the North Sea to Palermo, into a war whose issue no man can foresee. At the end of the conflict we should scarcely know why we had fought." In 1888, the German Emperor, Wilhelm I, died leaving the throne to his son, Friedrich III. But the new monarch was already suffering from an incurable cancer and spent all three months of his reign fighting the disease before dying. He was replaced by his son, Wilhelm II. The new Emperor opposed Bismarck's careful foreign policy, preferring vigorous and rapid expansion to protect Germany's "place in the sun." Conflicts between Wilhelm II and his chancellor soon poisoned their relationship. 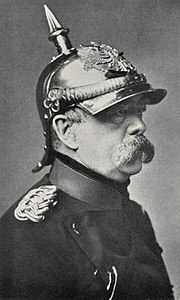 Bismarck believed that he could dominate Wilhelm, and showed little respect for his policies in the late 1880s. Their final split occurred after Bismarck tried to implement a far-reaching anti-Socialist laws in early 1890. Kartell majority in the Reichstag, of the amalgamated Conservative Party and the National Liberal Party, was willing to make most of the laws permanent. But it was split about the law allowing the police the power to expel socialist agitators from their homes, a power used excessively at times against political opponents. The National Liberals refused to make this law permanent, while the Conservatives supported only the entirety of the bill and threatened to and eventually vetoed the entire bill in session because Bismarck wouldn't agree to a modified bill. As the debate continued, Wilhelm became increasingly interested in social problems, especially the treatment of mine workers who went on strike in 1889, and keeping with his active policy in government, routinely interrupted Bismarck in Council to make clear his social policy. Bismarck sharply disagreed with Wilhelm's policy and worked to circumvent it. Even though Wilhelm supported the altered anti-socialist bill, Bismarck pushed for his support to veto the bill in its entirety. But when his arguments couldn't convince Wilhelm, Bismarck became excited and agitated until uncharacteristically blurting out his motive to see the bill fail: to have the socialists agitate until a violent clash occurred that could be used as a pretext to crush them. Wilhelm replied that he wasn't willing to open his reign with a bloody campaign against his subjects. The next day, after realizing his blunder, Bismarck attempted to reach a compromise with Wilhelm by agreeing to his social policy towards industrial workers, and even suggested a European council to discuss working conditions, presided by the German Emperor. Despite this, a turn of events eventually led to his distancing from Wilhelm. Bismarck, feeling pressured and unappreciated by the Emperor and undermined by ambitious advisers, refused to sign a proclamation regarding the protection of workers along with Wilhelm, as was required by the German Constitution, to protest Wilhelm's ever increasing interference to Bismarck's previously unquestioned authority. Bismarck also worked behind the scenes to break the Continental labour council which Wilhelm had set so dearly to his heart. The final break came as Bismarck searched for a new parliamentary majority, with his Kartell voted from power due to the anti socialist bill fiasco. The remaining powers in the Reichstag were the Catholic Centre Party and the Conservative Party. Bismarck wished to form a new block with the Centre Party, and invited Ludwig Windthorst, the parliamentary leader to discuss an alliance. This would be Bismarck's last political manoeuvre. Wilhelm was furious to hear about Windthorst's visit. In a parliamentary state, the head of government depends on the confidence of the parliamentary majority, and certainly has the right to form coalitions to ensure his policies a majority, but in Germany, the Chancellor depended on the confidence of the Emperor alone, and Wilhelm believed that the Emperor had the right to be informed before his minister's meeting. After a heated argument in Bismarck's estate over imperial authority, Wilhelm, stormed out, both parting ways permanently. Bismarck, forced for the first time into a situation he could not use to his advantage, wrote a blistering letter of resignation, decrying Wilhelm's interference in foreign and domestic policy, which was only published after Bismarck's death. Bismarck resigned at Wilhelm II's insistence in 1890, at age 75, to be succeeded as Chancellor of Germany and Minister-President of Prussia by Leo von Caprivi. Bismarck was discarded ("dropping the pilot"), given a new title, the Duke of Lauenburg, and entered into restless, resentful retirement to his estates at Varzin (in today's Poland). Within one month after his wife died on 27 November 1894, he moved to Friedrichsruh near Hamburg, waiting in vain to be petitioned for advice and counsel. As soon as he had to leave his office, citizens started to praise him, collecting money to build monuments like the Bismarck Memorial or towers dedicated to him. Much honour was given to him in Germany, many buildings have his name, books about him were best-sellers, and he was often painted, e.g., by Franz von Lenbach and C.W. Allers. Bismarck spent his final years gathering his memoirs (Gedanken und Erinnerungen, or Thoughts and Memories). He died in 1898 (at the age of 83) at Friedrichsruh, where he is entombed in the Bismarck-Mausoleum. He was succeeded as Fürst von Bismarck-Schönhausen by Herbert. "Jena came twenty years after the death of Frederick the Great; the crash will come twenty years after my departure if things go on like this" ― a prophecy fulfilled almost to the month. Bismarck's most important legacy involves the unification of Germany. Germany had existed as a collection of thirty-nine separate principalities and Free Cities since the era of Charlemagne. Over the next thousand years various kings and rulers had tried to unify the German states without success until Bismarck. Largely as a result of Bismarck's efforts, the various German kingdoms were united into a single country. Following unification, Germany became one of the most powerful nations in Europe. Bismarck's astute, cautious, and pragmatic foreign policies allowed Germany to retain peacefully the powerful position into which he had brought it; maintaining amiable diplomacy with almost all European nations. France, the main exception, was devastated by Bismarck's wars and his harsh subsequent policies towards it; France became one of Germany's most bitter enemies in Europe. Austria, too, was weakened by the creation of a German Empire, though to a much lesser extent than France. Bismarck's diplomatic feats were subsequently entirely undone, however, by Kaiser Wilhelm II, whose arrogant policies succeeded in not only offending and alienating, but actually unifying other European powers against Germany in time for World War I. During most of his nearly 30 year-long tenure, Bismarck held undisputed control over the government's policies. He was well supported by his friend Albrecht von Roon, the war minister, as well as the leader of the Prussian army Helmuth von Moltke. Bismarck's diplomatic moves relied on a victorious Prussian military, and these two men gave Bismarck the victories he needed to convince the smaller German states to join Prussia. Bismarck took steps to silence or restrain political opposition, as evidenced by laws restricting the freedom of the press, the Kulturkampf, and the anti-socialist laws. His king (later Emperor) Wilhelm I rarely challenged the Chancellor's decisions; on several occasions, Bismarck obtained his monarch's approval by threatening to resign. However, Wilhelm II intended to govern the country himself, making the ousting of Bismarck one of his first tasks as Kaiser. Bismarck's successors as Chancellor were much less influential, as power was concentrated in the Emperor's hands. Two ships of the German Imperial Navy (Kaiserliche Marine), as well as a battleship from the World War II-era, were named after him. Also named in his honour were the Bismarck Sea and Bismarck Archipelago (both near the former German colony of New Guinea), as well as Bismarck, North Dakota (a city and state capital in the United States). Numerous statues and memorials dot the cities, towns, and countryside of Germany, including the famous Bismarck Memorial in Berlin. The only memorial showing him as a student at Göttingen University (together with his dog Ariel) and as a member of his Corps Hannovera was reerrected in 2006 at the Rudelsburg. His student fellow at Göttingen university, John Lothrop Motley, describes Bismarck as Otto v. Rabenmark in his novel Morton's Hope, or the Memoirs of a Provincial (1839). His full style was; His Serene Highness, Prince von Bismarck, Duke von Lauenburg, and Count von Bismarck-Schönhausen. ^ a b Pflanze, Otto (April 1972). "Toward a Psychoanalytic Interpretation of Bismarck". American Historical Review 77 (2): 419-444. Crankshaw, Edward. (1981). Bismarck. New York: The Viking Press. Lerman, Katharine Anne. Bismarck: Profiles in Power. London: Longman, 2004. ISBN 0-582-03740-9. Palmer, Alan. (1976) Bismarck, Charles Scribner’s Sons. Otto Pflanze. (1963). Bismarck and the Development of Germany. Princeton University Press. 3 vols. (Princeton University Press, 1990). Taylor, A. J. P. (1955). Bismarck: the Man and the Statesman. London: Hamish Hamilton.